With the iXpand drive, SanDisk is providing an on-the-go flash device for users of iPhones and iPads. It has been designed to be plug-and-play (after you install and app for it), and at its most basic level it’s a two-headed flash drive with both USB and Lightning interfaces. It's available in capacities of 32GB or 64GB. This review is of the 32GB version. Unlike similar two-headed drives for Android devices, the iXpand has a battery installed that is used to supply it with power. This battery is a requirement for Apple devices, mainly so that what you plug in to your i-device doesn't diminish its battery life. But this means that in order to use the iXpand drive, you have to first make sure that it’s charged (though it's pre-charged out of the box). You can do this by plugging it in to the USB port on a computer. What you can do with the iXpand drive is simple: you can store video files, music files, and photos, which you can then access and play on your i-device through the SanDisk iXpand Sync app. Using this app, it doesn't matter what types of files you have, you will most probably be able to play them on your iPhone or iPad. From left to right: iXpand Sync settings and status, backing up camera roll, decrypting a vault. For our tests, we tried AVI files, MP4 files, MKV files, and ASF files (that one was a random one that we found lying around), and the iXpand allowed us to watch them all. It wasn’t perfect, though. We found that we couldn’t use the scrubber to fast forward through AVI files. Forwarding caused pixelation and made the files unwatchable. However, there were no such forwarding issues with the other file types. Music files stored on the iXpand can also be played back on drive through its app, and it even supports FLAC files. It’s a decent way to store loads more music locally than your phone or tablet can handle, and you could also store it at a higher quality level than you might be used to, especially if you’re the type who rips CDs. The USB interface of the iXpand isn't quick. We observed a slow rate of 11 megabytes per second when transferring multi-hundred megabyte files from a Windows-based laptop. The formatted capacity of the iXpand is 29.7GB, and it uses the FAT32 file system, which means you can’t get files greater than 4GB onto it. In addition to being a drive that you can use to bring extra movies and music storage to your iPhone or iPad, you can also use the iXpand drive as a backup device for your contacts and photos. 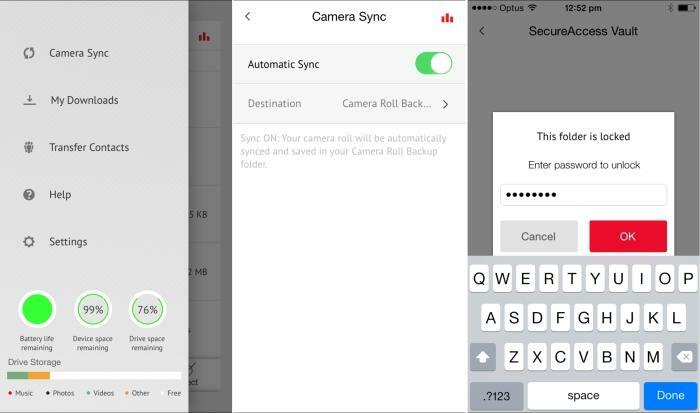 Your device’s camera roll can be synched so that any photos you take are automatically saved to the drive. Encryption is available as well (for PC, Mac, iPhone and iPad), so that any sensitive files stored on the drive won’t be accessible in case you ever lose the drive. The encryption is in the form of a password-protected vault, into which you can move all the files you want to secure. We found that if we encrypted media files, we had to move them outside of the vault in order to play them. The design of the iXpand drive is a little odd. Both the USB port and the Lightning connector face the same direction, with the Lightning connector residing on the end of a flexible, rubber cable. The flexibility of this cable makes it a little harder to accidentally snap the connector when it’s plugged in to an iPhone or iPad while you're on the go, and having both connectors on the same end is perhaps due to the battery type that’s installed in the drive. SanDisk told us that the slim, flexible connector has also been implemented so that it can be easily used on mobile devices that wear a protective case. A tiny LED is located on the right side of the drive, and is almost impossible to see if you have it plugged in to a laptop. Luckily, there is a battery indicator in the app. Furthermore, the drive is quite wide, meaning it can encroach on the space of adjacent ports when plugged in (on a Windows laptop, at least). The SanDisk iXpand is available now and costs $129 for the 32GB version, and $179 for the 64GB version. It’s made out of metal and has a 2-year warranty. Pick one up if you want an easy way to watch almost any video files on your Lightning-equipped iPhone (5, 5c, 5s, 6, 6 Plus) or iPad (mini, mini 2, mini 3, Air, Air 2), or if you want an easy way to back up photos and videos off your device without using the Internet.